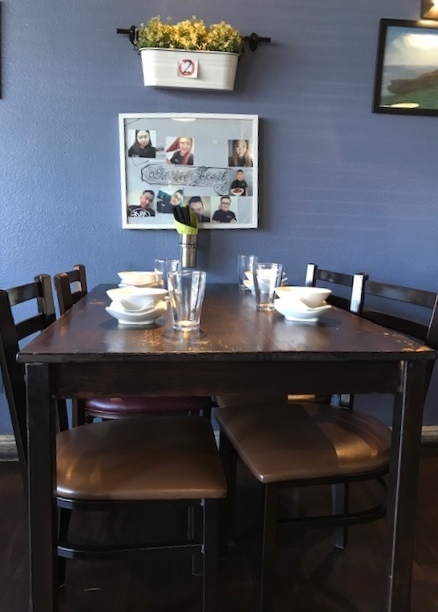 In the small plaza across from Stater Bros., Hayato (best Japanese restaurant in Claremont) and Mediterranean mainstay Darvish are firmly lodged, while Chinese restaurants have come and gone. Hi Family, though, has hung in there for four years, according to Yelp; after a foodie friend recommended it, we made plans to eat there. Unfortunately, that was on a Wednesday, the one day it’s closed. A few weeks later, in Claremont at lunchtime on a Monday, I gave it a spin solo. It’s small, just eight tables, with dark wood and cobalt walls. The menu has a few standard American Chinese dishes like orange chicken, but most of the menu is real Chinese. The first thing they bring out is a tumbler of water with slices of cucumber inside, an unusual but welcome flourish. My friend said he’d had dan dan noodles and rattan pepper beef. 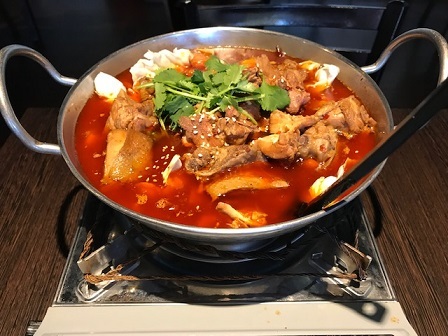 Noticing that hot pots seem to be a specialty, I got the chicken, small size ($19), after they were out of short rib, my first choice. But that’s just as well, as Los Chicken, as it’s known, appears to be the most popular dish. The name is evidently a Mandarin pun, a shorthand version of Los Angeles as well as chicken, if I understand what I read correctly. 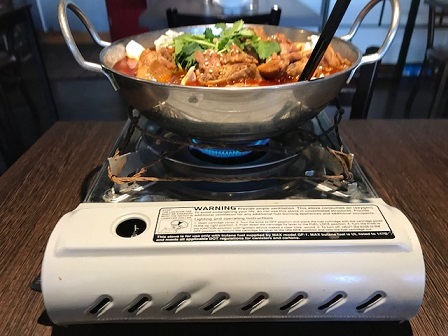 They bring out a portable stove to keep the soup hot. The soup had chicken (with bones in some cases), cabbage, chile oil and no doubt more. I ordered it medium spicy, which in my case was too spicy. I was blowing my nose into my napkin and gulping that cucumber water. But it was tasty, generous with the chicken and with searing oil. The soup stayed hot and there were leftovers enough for two more meals. I also had an order of rice ($1), spooning the soup into a small bowl and mixing in the rice. Once outside I noticed the sandwich board special for “crawfish rice.” Had I seen that going in I might have ordered it. 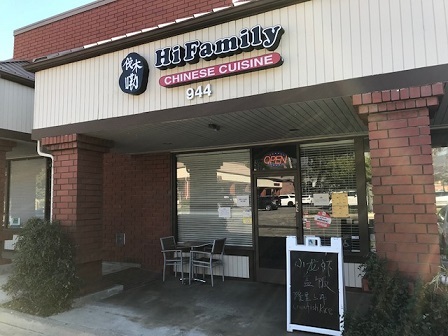 Szechuan-style Hi Family is the most authentic of the (I believe) three Chinese restaurants in Claremont, with Upper House being a middle ground (with more seating too) and Mr. You Express, which I haven’t visited, a fast-food spot. It probably goes without saying that Hi Family is for the more adventurous diner — although you could always get orange chicken. This entry was posted in Restaurants: Claremont and tagged Chinese, Claremont, restaurants by David Allen. Bookmark the permalink.